I have a long-time friend who is a compulsive shopper. And I do mean compulsive. There is no “off” switch for Rhonda when it comes to coveting the next Big Thing. Rhonda was always the one who had a toy first, from EZ Bake Ovens to Pet Rocks to gaming cards. Her parents were wealthy and indulged her. As she grew up and started working for herself, she created a company that made her wealthy in her own right. But she always seemed to be short on cash. When we’d meet for lunch, she’d always need extra room at the table for her “loot bags” of the day. There would be a new pair of shoes she couldn’t do without. She’d haul out an adorable baby outfit, saying, “I don’t know who this is going to be for, but it’s so cute I couldn’t leave it on the rack.” She’d show me the newest kitchen gadget from the home store, the twelfth pair of sheets for the guest bedroom that just “looked so soft,” the five new audiobooks she was “planning to get to”…and on and on and on. She was shocked. But she swallowed hard, and did it. And made over $42,000 just on the “extras” that she had stuffed into her five-bedroom house. Now, most of us aren’t nearly that bad. But we are all subject to the “dragon hoard virus” from time to time. Do a little exploring. Start with the room that means the most to you, whether it’s kitchen or craft room or office. How many things in your kitchen have you overbought because you forgot you had them? How many bolts of cloth and patterns do you have stocked for future use? How many articles of clothing have you purchased because they beckoned to you at the time but you’ve never worn them? How many reams of paper, how many odd office tools? Even your file cabinets – how stuffed are they? Do you ever throw things away, or store old files you don’t use? Look at your bank account. How many online impulse buys have you made (games, cool doo-dads and gadgets, website subscriptions)? How many times have you used those items? Even more — do you realize how many you have that you can’t even remember purchasing? What about the online subscription sites you belong to: do you even remember you have them, or how often they automatically renew? 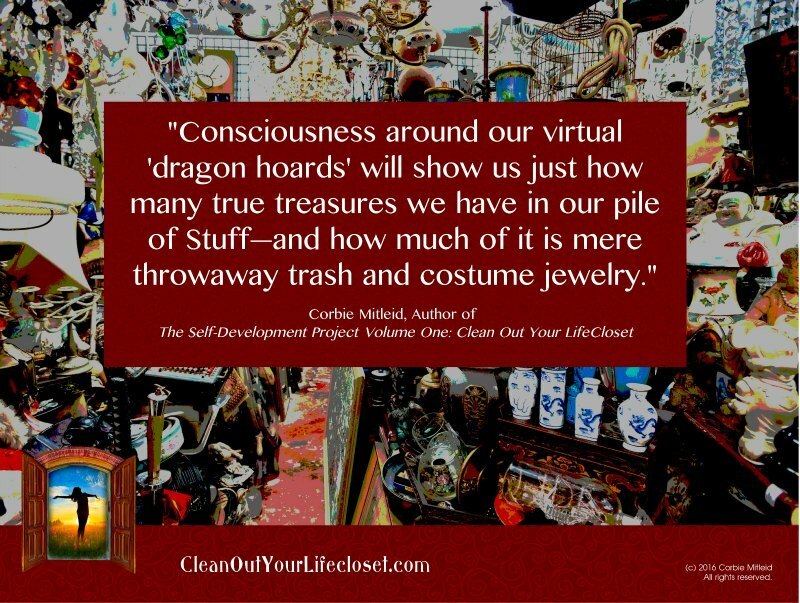 Consciousness around our virtual “dragon hoards” will show us just how many true treasures we have in our pile of Stuff—and how much of it is mere throwaway trash and costume jewelry.